Progressive metal through the years has become an interesting genre. You have those bands who have essentially become Dream Theater worship and then you have those bands who are actually progressive, pushing new ideas such as Devin Townsend, Ihsahn and Sigh just to name a few. UK prog metal band Aeon Zen as much as they try, is of the former as they incorporate many of the features of Dream Theater such as tempo changes, contrasts between heavy and light with excellent musicianship. While they do attempt to change things up and make things different, their most recent album “Enigma,” evidently shows the long list of their influences. 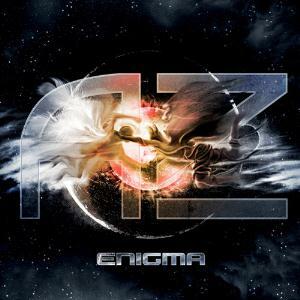 “Enigma” kickstarts with an instrumental, which essentially sounds like the a-typical Dream Theater clone of subtle keyboard/synths trading off with the juxtaposition of meaty guitar riffs and double drum beats. Needless to say, it doesn’t bode well for the album in terms of spinning a genre that is truly becoming more and more mediocre by the moment. It continues with the first track “Artificial Soul”, not a bad song, but it just remains pretty by the numbers prog with basic heavy riffs and unremarkable vocal lines. One thing the track does do well is the subtle atmospherics between the heavy parts, but in the end it becomes an opening track that doesn’t do a lot to keep the listener’s attention. Now at this point I figured what Aeon Zen was going to do was a regurgitation of the first two tracks; however, this is where the album goes into bizarre territory with the next track “Divinity”, where the band tries their hand at progressive death metal, with chunky riffs and growly vocals before changing it up in pieces with subtle keyboards and the tried and true melodic vocals of Andi Kravljaca. As noted by the melodic tendencies that chime into the song, the Aeon Zen style does exist within the song and it is of much better quality than the previous tracks. However, the problem is the song comes completely out of left field for a band that doesn’t really incorporate death metal vocals all that much. Is it progressive? I don’t know, because it comes off as wanting to force change instead of creatively making instinctive musical choices for the betterment of the band. This change in sound doesn’t end with “Divinity” though, as “Warning” starts with the wonderful atmospheric keyboards and synthesizers before strangely becoming Devin Townsend worship. Yep, you heard that right, this track is very oddly placed on an “Enigma” as not only do the vocals try to imitate Devin Townsend, but the song structure and groove guitar style Devin often incorporates into his music is all over the song. I mean, had you not told me this was another track off Aeon Zen, I would’ve thought for sure this was a new Devin Townsend track besides the occasional traditional Aeon Zen vocals and melodic tendencies. Needless to say, there is a theme with “Enigma”, which is that it’s really all over the place. Many times in progressive music this is a compliment, but even the most progressive of bands still have a signature sound, despite changing it up. This is not the case with Aeon Zen. There’s no doubt there are some solid tracks on here such as “Still Human” which incorporates some incredibly technical keyboard chops with some very beautiful melodic guitar and vocal work, as well as the epic album closer “Downfall.” The problem truly lies in the fact that the album is very inconsistent. Basically, if there is one thing you can say about Aeon Zen’s “Enigma” is that they’re having an identity crisis. They’re trying to push boundaries and they’re trying to separate themselves from the plethora of progressive metallers out there. Unfortunately though, it just doesn’t work on this album. From the random death metal style found on a small sample of the tracks, to the pure Devin Townsend worship, to the more traditional Dream Theater worship and everything in between, this album is all over the place without any cohesion. It would be one thing if this was a compilation of several bands. If that were the case, I probably would recommend this album as it’s a slice of various progressive genres of metal, but when it comes down to it, there is no substance here. There is no flow to the album, and the band tries to be things it isn’t. Needless to say, while there is some good stuff to be heard on “Enigma”, it isn’t the first time we’ve heard it, nor is it the best version we’ve heard played. Unless you are a prog metal junkie, this one isn’t necessary to one’s collection. This entry was posted on January 27, 2013 at 12:44 am and is filed under Reviews with tags Aeon Zen, Circus Maximus, Devin Townsend, Dream Theater, English prog, Enigma, Progressive Metal. You can follow any responses to this entry through the RSS 2.0 feed. You can leave a response, or trackback from your own site.